Don't you just love the new vintage baseball set from Artistic Outpost it's called Cracker Jack! On this card I used the Out of the Box Technique with one of the images from the Artistic Outpost Cracker Jack Plate, stamping the image in Chocolate Chip. 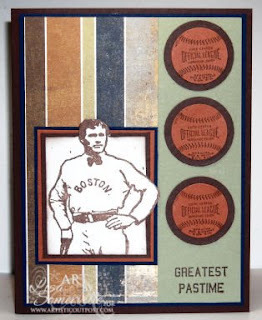 The Baseball's are also from this same plate, and work perfectly with Stampin' Up! punches, or Nestabilities! Great manly all occasion card! My Son was quite the ball player. He would just love this card! You did a great job on this card!